What makes a perfect breakfast? When there are some thin warm crepes present. Try them also with our homemade hazelnut spread or your favorite marmalade. Add egg yolks to a stand mixer and start whisking. Add milk and salt. Keep whisking until well combined. Deseed vanilla bean and add the seeds to the stand mixer. Add the melted butter and flour. Whisk thoroughly until smooth batter forms. Pour the batter in a measuring cup. Butter the griddle. Pour out the batter and spread evenly across the griddle. 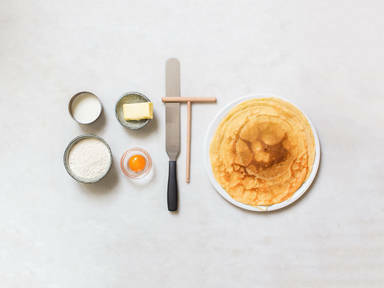 Then gently flip the crepe with the help of an offset spatula. When the crepe is done, fold in half and then in half again. Transfer the crepe to a plate. Sprinkle cinnamon sugar on top and enjoy!